Hi! I'm Rachael. I am grateful to introduce myself as a full-time Thai yoga therapist, yoga + Ayurveda teacher, accountability partner, and facilitator of community + authentic, meaningful connection. Let me be the first to welcome you to our beloved On Track Yoga community! Since my teaching journey began in 2010 I have completed thousands of hours of training in various styles of yoga and related healing arts, all of which work together to inform my personal teaching style. Although I enjoy teaching a variety of classes including vinyasa flow, gentle/therapeutic, restorative, yin, and aerial yoga among others, my regular classes predominantly consist of strong but accessible mindfully-paced flows with great emphasis on breath, spinal alignment, and core connection. Class rhythms often evolve with the changing seasons in alignment with the teachings of Ayurveda. Working with people one-on-one is my true passion. I believe in creating authentic and meaningful connections using the healing practice of Thai yoga therapy and through private + small group yoga instruction, whether introducing new students to yoga or addressing the specific needs of any level of practitioner. I am also pleased to offer personalized lifestyle consultations for students committed to tangible transformation and self-healing using the principles of Ayurveda. My intention is to serve. I teach to help you feel supported and at ease, to encourage confidence and authenticity, to challenge you to step outside your comfort zone, and to inspire you to practice and live with integrity, compassion, and joy! Please don't hesitate to contact me if you feel that I may be of service now or in the future, or if you have any questions about our studio. Aman is a 200hr RYT, writer, part-time professor, and horse enthusiast. Aman seeks yoga in all spaces, and sees yoga as community building and a practice of social justice. Aman believes in yoga as accessible to all communities. When not teaching, Aman enjoys travel, drawing, and hiking. Originally from Boiling Springs, SC, Christy relocated to Charlotte in 2004, and has resided in Mount Holly since starting her career with the North Carolina Forest Service in 2010. She has always led an active lifestyle mostly outdoors barefoot, and discovered Yoga while in college. Since completing the 200-hour Yoga Teacher Training alongside a good friend and hiking mate in June 2016 through Bella Vita in Charlotte, NC, she has a renewed commitment for balance, core strength, flexibility and presence in and out of the studio. Christy values the benefits Yoga has brought into her life and wishes to share this Growth and Health with others. Leslie spends her days working in the Natural Resource Conservation field, but has recently added yoga teacher to her repertoire. Leslie took private yoga classes for about a year and after a lengthy hiatus returned to practicing yoga a few years ago upon recovering from a flare up of a chronic illness. After building a consistent practice and completing an Aerial yoga teacher training, Leslie decided she was ready to complete her 200 hour yoga teacher training. Leslie is registered with the Yoga Alliance as an RYT-200 and is excited to begin her journey as a yoga teacher. Due to her scoliosis and joint hypermobility, Leslie has a strong interest in focus on proper alignment and use of props and modifications to make yoga appropriate and accessible for her students (and herself). Natalie's love of yoga started in 2008 as a means of stress relief. After leaving her job in 2009, she began to volunteer at Peachtree Yoga Studio in Atlanta to be able to attend classes. It wasn't long before she decided that there was more to it and finished the 200-hr teacher training course through Peachtree Yoga, a Yoga Alliance certified program, in 2010. She enjoys sharing the gift of yoga with others, especially relaxation through hands-on-assist. 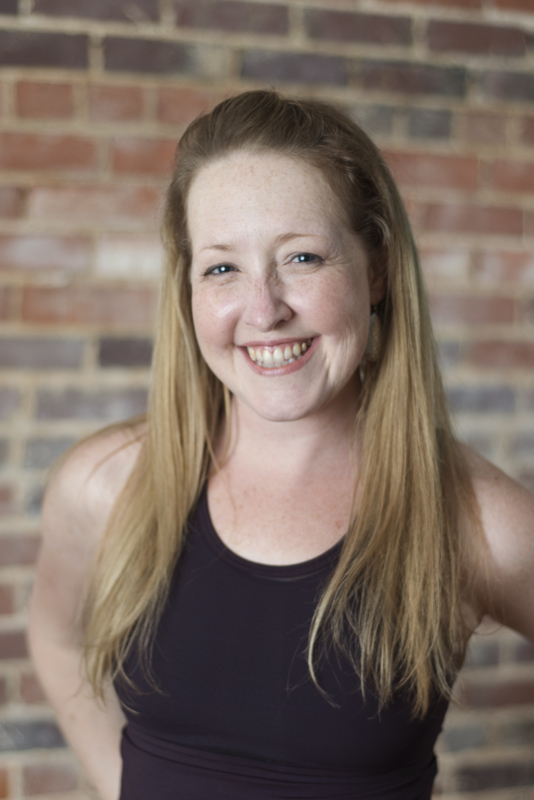 began her journey with yoga in 2009, reconnecting with herself in her early 40’s.The physical, mental and spiritual aspects of yoga were life changing and she received her first few Yoga Alliance Certifications with Stephanie Keach and her staff at Asheville Yoga Center in 2012. She completed Advanced Yoga Training in 2017 with Mara Healy at Be Yoga expanding her knowledge to include the Principles of Universal Yoga, spirituality, and mysticism. She has also spent years learning the principals of and building a strong personal foundation of Anusara yoga as a student of Sarah Faircloth, studied Sanskrit with Zoe Mae of the American Sanskrit Institute, trained with Gary Kraftsow, Douglass Brooks, and various other masterful teachers. This ongoing process of learning is what provides the fresh insights that inspire her teaching. Healthy breathing, alignment, and balanced energy flow are consistent points of focus in her classes. An alignment based teaching style is intuitive and nourishes the hidden strengths of her students while challenging them to reach beyond their perceived limitations. Her descriptive posture placements help the student create more space in their yoga practice, hopefully transforming their way of thinking off the mat. You will leave her classes feeling enlivened and renewed.